I chose to style an outfit around several new pieces in my wardrobe. I began my look with this babydoll acid wash denim dress. Recently, I ordered this dress from Forever 21 HERE for $22.80 and couldn't be any happier with my purchase. This is the ideal dress for spring; the babydoll fit, micro-mini length and acid wash print all have me swooning. 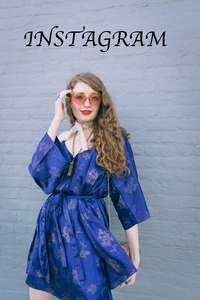 Not to mention the fact that this dress is incredibly easy to style. Next, I layered my new black fringe kimono over the dress. Joah Brown recently sent me this kimono courtesy of ShopLately. This is the "Black Fringe Kimono" in black and retails for $38 + shipping. You can find it HERE. I ordered a size medium. I've been wearing this kimono nonstop the past few days and am absolutely in love with it. It is just such an easy-going, free-spirited piece that I can't resist it. However, the first few times I wore the kimono, the fringe kept getting caught on things and tangled. I think that the problem was caused because the fringe was like loops of fringe instead of single strands (if that makes sense.) To solve that problem, I simply cut the loops into two pieces of fringe so that they weren't attached as loops. Now I have no problems with the fringe getting tangled or caught in anything. The warm weather also gave me a chance to debut my cute new jelly sandals. These are the JuJu "babe" sandals in white. Although they were on the more expensive side for me (about $40), I am really pleased with this purchase. They are just so darn cute! 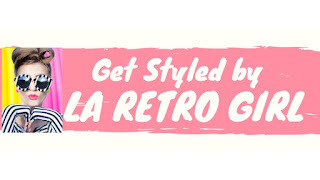 And how could I resist the retro vibe and adorable heel? I have a feeling that I will get a lot of wear out of these "babes" this spring. 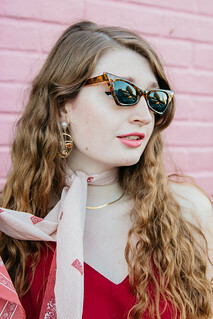 Red lips, bold sunglasses, lace ankle socks and a leopard print crossbody bag completed my look. These lace ankle socks and bold sunglasses are also pieces that are new to my wardrobe. ILoveSexy.Com recently sent me these socks to feature on my blog. These are the "Anklets with Lace" in black and retail for $7.45. I am very impressed with the quality of these socks and find the style of the socks beyond sweet. I love how they look with my jelly sandals and feel that this may be a popular sock-shoe combination for me this spring. ZooShoo sent me these bold sunglasses courtesy of ShopLately. These are the "Oyster Club Shades" and they retail for $15 + shipping HERE. I love the glamorous statement that these shades make. Hello! 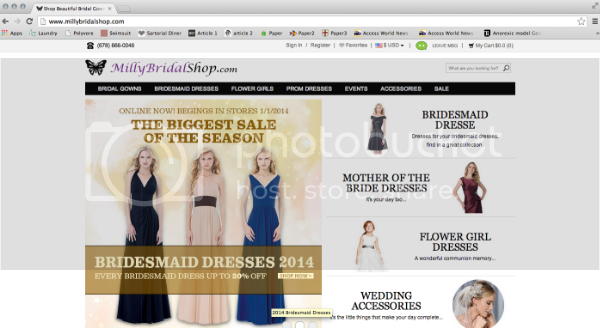 Today I have an online shop to introduce to you guys- MillyBridalShop.com. Milly Bridal Shop offers bridal gowns, bridesmaid dresses, flower girl dresses, prom dresses and accessories. They offer a wide variety of different styles of formal dresses. Whether you are looking for an A-line dress, sheath dress, ball gown style dress, empire style dress, etc., Milly Bridal is sure to stock what you are looking for. They also provide dresses in every length from above the knee to floor length. And they offer dresses with every different neckline, texture and embellishment possible. How could you not find what you're looking for? Prices range from about $100-$300 for bridesmaid dresses and prom dresses while prices range from about $100-$900 for bridal gowns. Milly Bridal Shop provides friendly customer service, fast shipping, professional packaging and a guarantee that they "will provide all our dearest customers with the best quality products, the most preferential price and the most satisfied service. "Milly Bridal Shop also offers a rewards points program for customers which also customers to earn points which they can use towards future programs. If you are looking for stylish 2014 bridesmaid dresses then Milly Bridal Shop is the shop for you. Have you guys heard of Milly Bridal Shop before? ***Disclaimer: MillyBridalShop.com provided monetary compensation for this post but I wrote the actual post and all opinions written in this post are mine. Hello! Essentially all that I've been wearing recently is black. There is just something so sophisticated and chic about outfits revolving around the color black. I've taken the meaning of black as a staple color to another level entirely. Today, I styled my look around this black and white polka dot dress. I simply layered a black open knit sweater over top of the dress and opaque black tights under the dress to make the dress more appropriate for the season. A plain black coat completed the layering present in my look. Next, I cozied up with a tiger-printed infinity scarf. 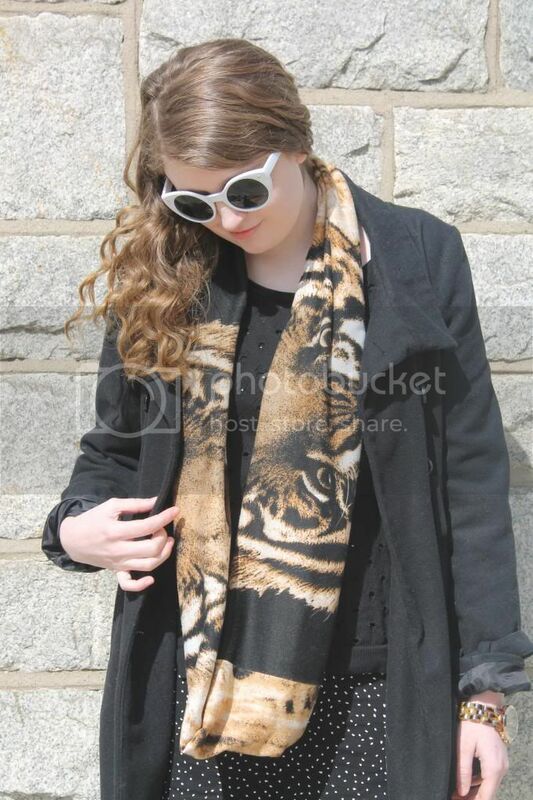 This scarf is the "Heart of a Tiger" scarf sold by Glint & Gleam. To bring out the color in the scarf, I slipped into a pair of tan Jeffrey Campbell heels. This is the first time that I have worn these heels and I am currently swooning over them! So chic. I accessorized with a pair of white sunglasses that I bought at Buffalo Exchange this past weekend and with a neutral watch.